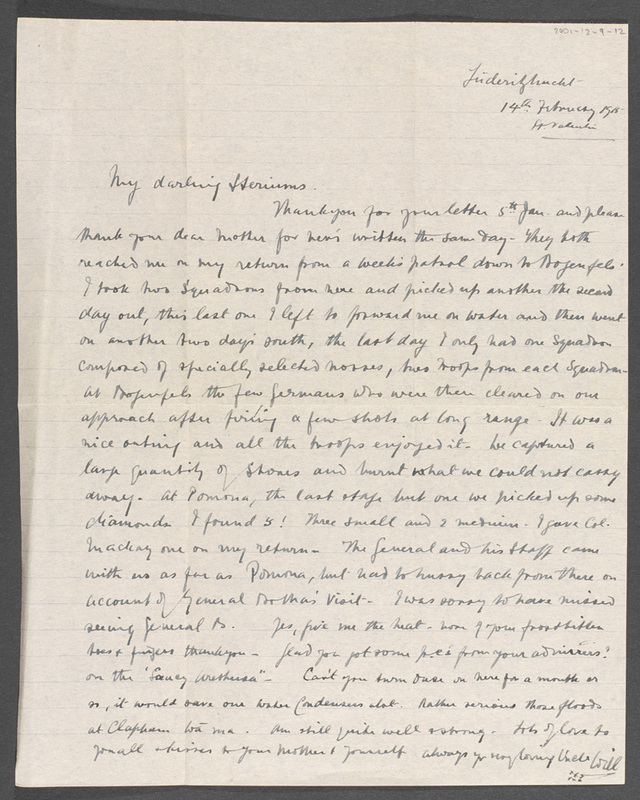 Letters sent home by Major John Montgomery, 1st Mounted Rifles (1st Natal Carbineers), vividly describe the successful campaign fought by South African troops in German South-West Africa. On 9 July 1915 enemy forces in German South-West Africa (now Namibia) surrendered to the Allies. This marked the final stage of a short but successful campaign of manoeuvre fought in extremely harsh conditions. Undertaken by South African colonial troops, the campaign was aimed at preventing the German navy from using the colony’s ports. There were also several powerful radio transmitters in South-West Africa that could be used to direct naval raids against British shipping. 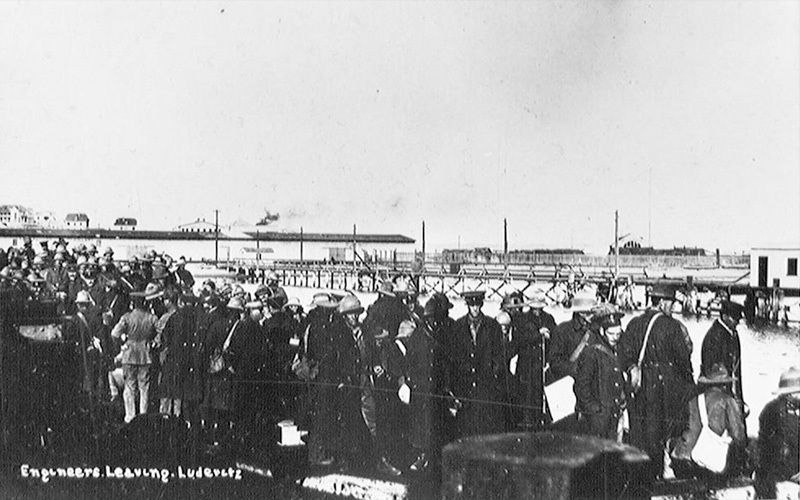 South African soldiers were mobilised along the southern border of South-West Africa in August 1914 and the port of Lüderitz was quickly occupied by 1,800 troops on 18 September. Further operations were delayed by a revolt in South Africa among disaffected Boers, unreconciled to their defeat by the British in 1902. However, frontier skirmishes continued, including a German victory at Sandfontein on 26 September 1914, and a German invasion of the South African enclave of Walvis Bay on Christmas Day. The rebellion to which Montgomery alluded had been initiated by Lieutenant-Colonel Manie Maritz and several other officers. 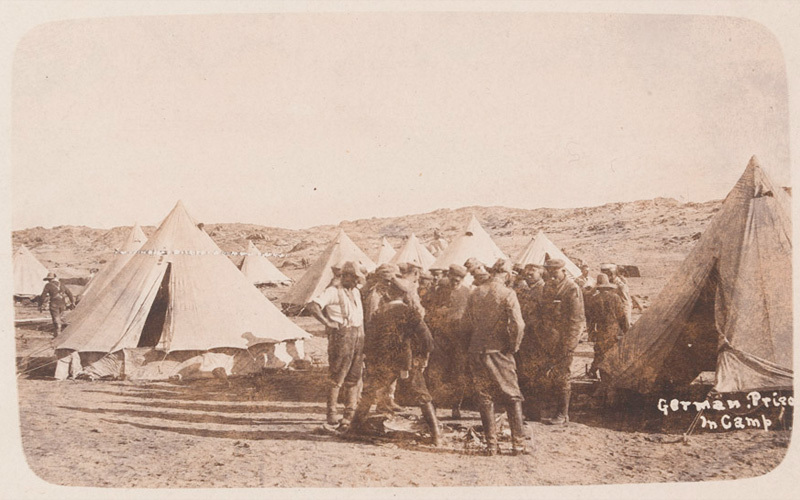 After issuing a proclamation calling on the Boer population to rise up against the British, they gathered a force of about 12,000 rebels in the Transvaal and Orange Free State. The pro-British government declared martial law and forces under the command of Generals Louis Botha and Jan Smuts defeated them on 24 October 1914. 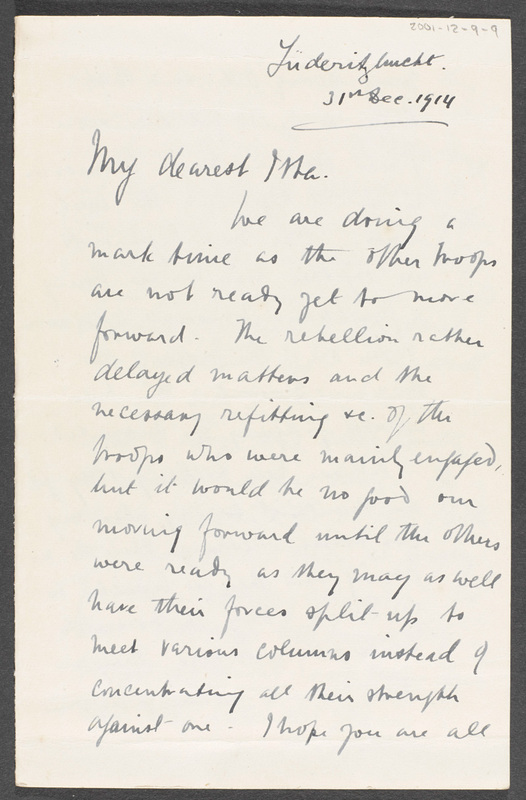 The rebellion was effectively over by early February 1915. Montgomery was correct. 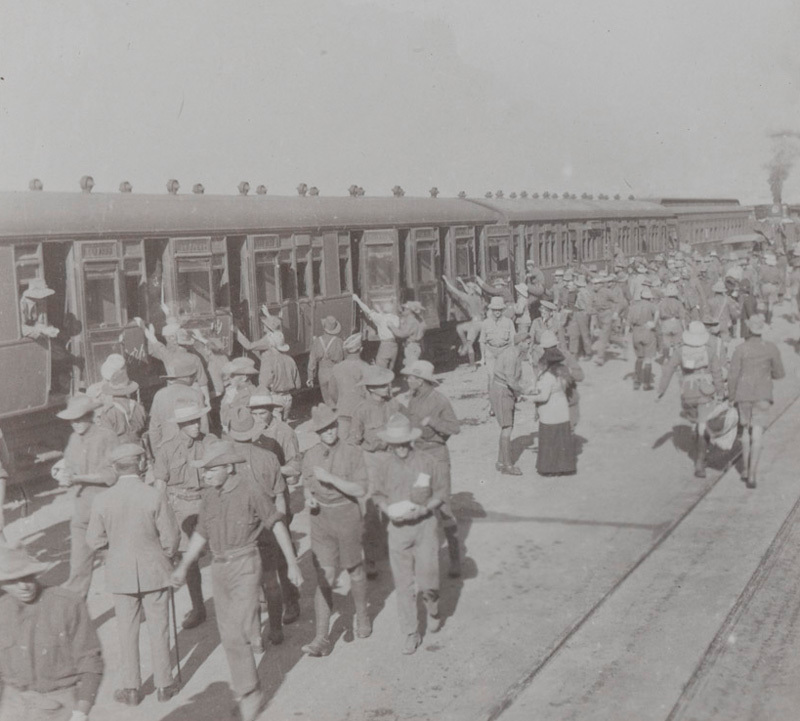 In late February 1915, a largely volunteer force of 60,000 South Africans, moving in four columns, finally began moving again into enemy territory. 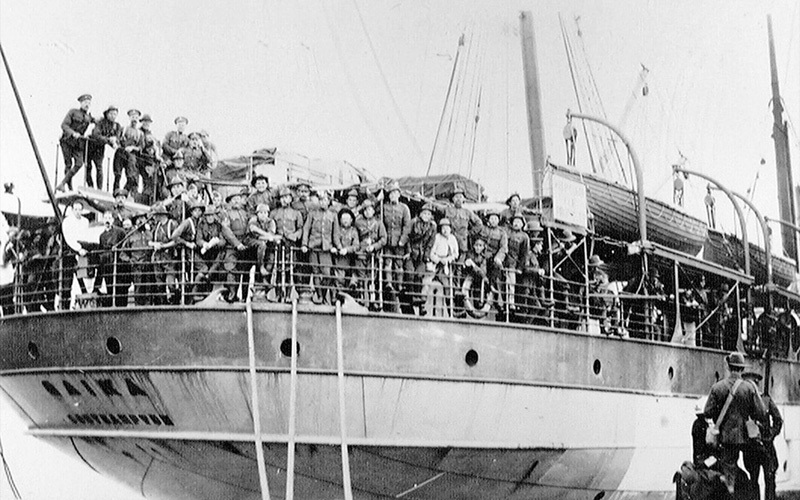 To face them the Germans had around 6,000 colonial soldiers. 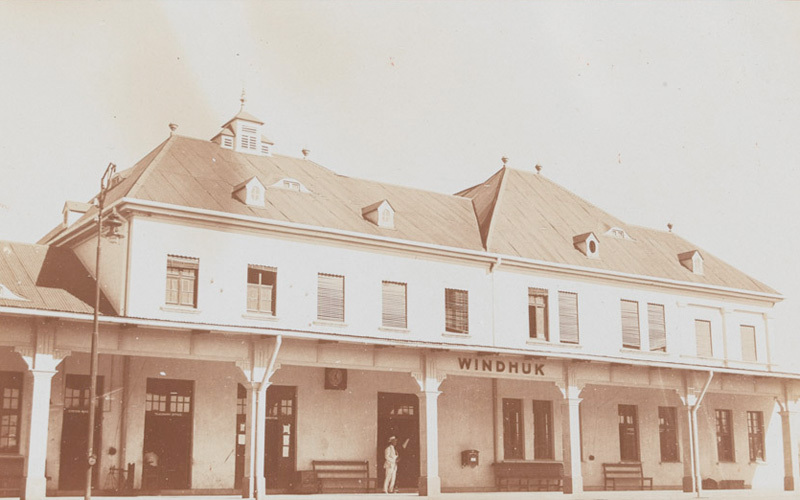 The prime minister of South Africa, Louis Botha, organised an attack from several directions, including a landing of troops at Swakopmund. Using fast-moving mounted units that made wide outflanking thrusts, Botha succeeded in confusing and dividing the small defending force. This was despite encountering some strong resistance, as well as being delayed by mines and water shortages caused by poisoned wells. The decisive battle of the campaign was fought at Gibeon on 27 April 1915. The Natal Carbineers lost two men killed in this engagement, but Montgomery was Mentioned in Despatches by Brigadier General Duncan McKenzie, commander of Central Force, ‘For service in pushing home the attack and pursuit of the enemy at Gibeon’. The Germans were gradually squeezed into the north-west corner of the territory. 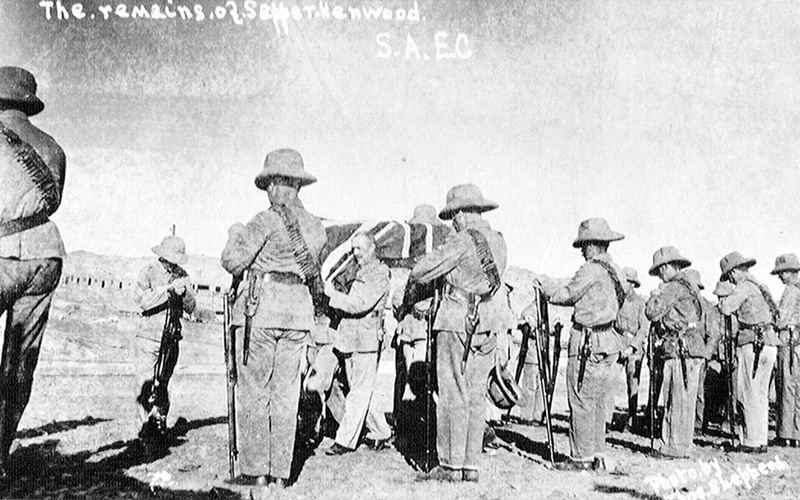 Defeated at Otavi on 1 July 1915, they finally surrendered at Khorab eight days later. The victory had been won with a minimum of casualties and was one of the first major Allied successes of the war. John Willoughby Verner Montgomery (1869-1968) was born at Brantford, Ontario in Canada in 1869. He was the son of Captain Alexander Nixon Montgomery of the 7th Regiment of Foot (Royal Fusiliers) and Istere Alicia Montgomery (née Atrutl) of Gibraltar. John was the eldest son among nine children. His family later settled near Pietermaritzburg in South Africa where his father joined the Natal Native Contingent. John was educated at Hilton College in Natal and joined the Natal Carbineers in 1888. He went on to serve during the Boer War (1899-1902) as a non-commissioned officer but was eventually commissioned as a lieutenant in the Composite Regiment formed from the Natal Volunteers. He was mentioned in Lord Roberts’s despatch of 23 June 1902. He later served with the Carbineers during the Zulu Rebellion (1906). He took part in the Battle of Mhome Gorge on 10 June, which marked the end of the rising. Montgomery then farmed at Ismont, Mid-Illovo, Natal, but he and most of his family subsequently moved to Britain, settling at Sharnbrook near Bedford. Montgomery later returned to farming in Natal. 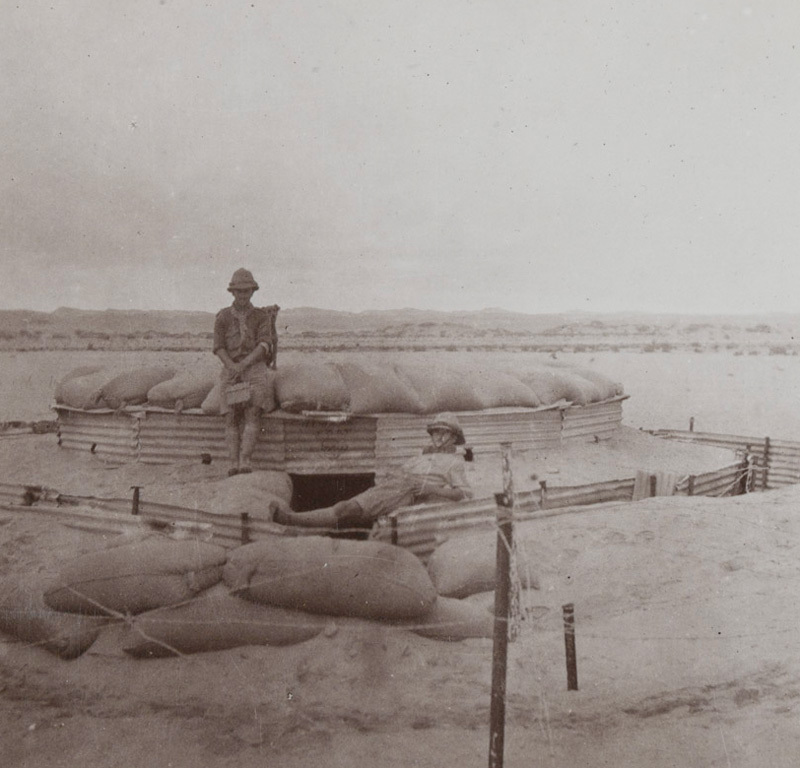 On the outbreak of the First World War his regiment was called to the colours on 8 August 1914 for service in German South-West Africa, where its two battalions landed at Lüderitz. At the conclusion of the South-West African campaign, many members of the Natal Carbineers elected to serve with other units in Europe or East Africa, but Montgomery remained in South Africa. He eventually became a Companion of the Distinguished Service Order for his services (London Gazette 22 August 1918). Montgomery’s wife gave birth to a son on 15 April 1918. He ended the war as temporary lieutenant-colonel commanding the Carbineers. In later years he continued to farm at Ismont and was appointed honorary colonel of the Carbineers in 1952. He died in April 1968 at the age of 99.